You can find hundreds of games on the internet that will teach all sorts of things to your children but it can take hours and hours to find anything worthwhile or relevant. The following games are our selection of the best, covering everything we think that you would be interested in incorporating into a One World Week event. This list of games has been adapted from www.creativekidsathome.com. They are designed to encourage a sense of teamwork amongst children, something that is very important in understanding what it means to Live for One World and for establishing a culture of peace. The games will often avoid having a ‘winner’ or a ‘loser’ as this enforces the sense of competition and individual achievement. They are self-explanatory and often require little or no extra resources beyond a facilitator and some energetic children! 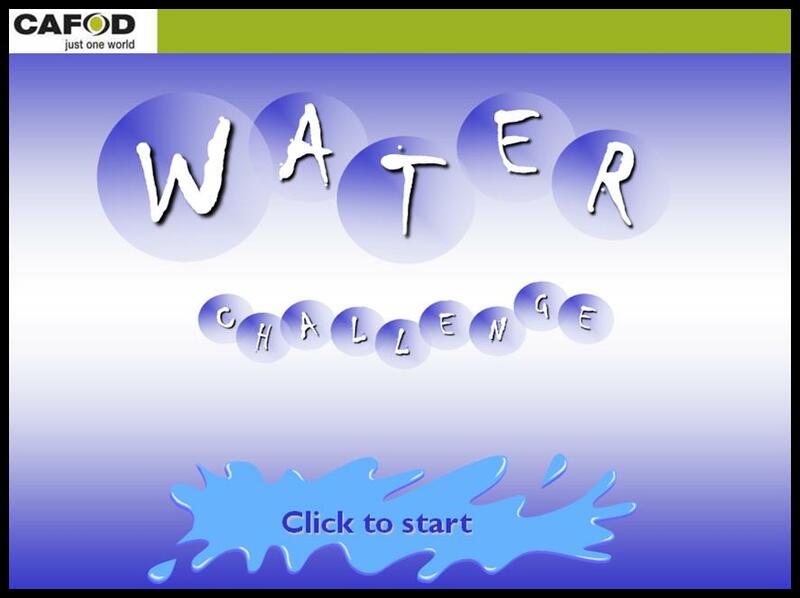 Quizzes and activities from CAFOD - these are designed for use in schools but can be used at OWW events with just a little adaptation. A game to help show how we in the UK have links with so many countries and cultures around the world. Find answers to the questions by going around the room. It makes a great "Ice breaker" by getting people talking to each other! The resource is designed for 7-11 year olds, and comes as a downloadable interactive PowerPoint quiz which can be used as a group or on an individual basis. This is a pdf document and provides the rules of the game and the quiz questions and answers. This game is designed to be played as part of an assembly or a large group The game requires two teams, with one volunteer on each team to come up to the front and answer the questions, and they can choose a friend to come up with them to be their ‘play piece’. Correct answers earn a step forward. There are two quiz sheets: KS2-3 questions and KS3-5 questions. Click on the second resource down called ‘poverty stops children going to school’. 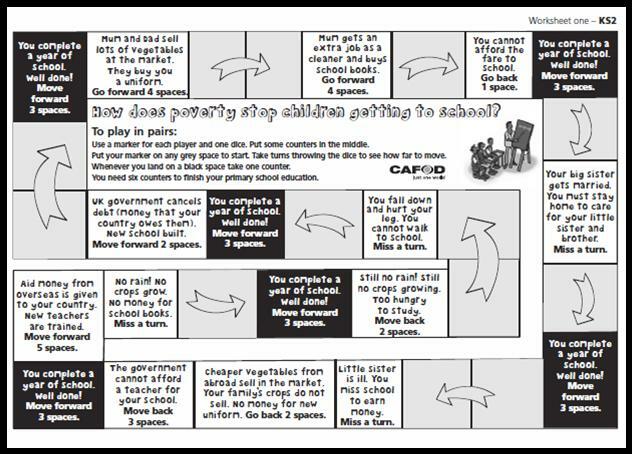 CAFOD have created a free board game looking at how difficult it can be to complete your education. Obstacles representative of real life challenges in the developing world stand in the way of you collecting enough tokens to finish school. In Bangladesh communities are fighting the consequences of climate change by building floating gardens, rafts that they grow their crops on. Instructions on how to build a model of a ‘floating garden’ in a washing-up bowl, using very simple materials, are provided, along with more information on the project. Suitable for KS2-4. Choosing fairly traded products is one way in which we can actively engage with "Living for One World", establish a culture of peace, or explore what it means to be part of one world, whether as individuals, places of worship, businesses, schools, or Voluntary organisations. 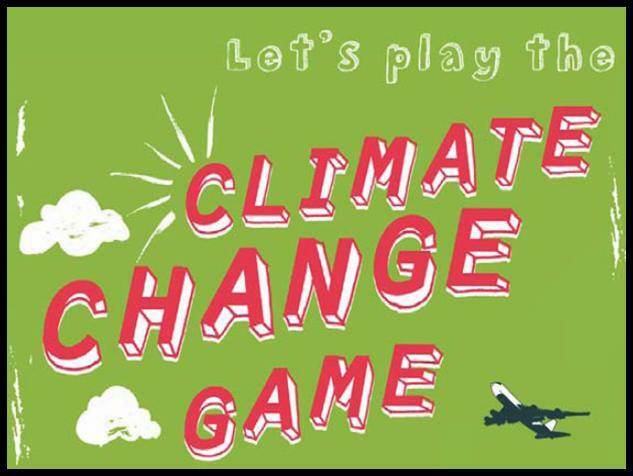 These Fairtrade games give children an insight into the challenges associated with trading rules, and also introduces them to exciting Fairtrade products! 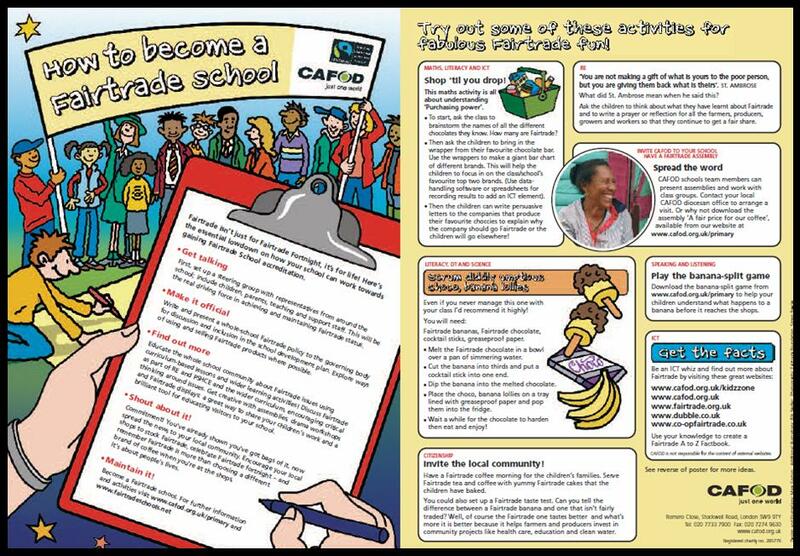 On CAFOD's primary school Fairtrade resources page you will find a resource called ‘Focus on Fairtrade Folder’. Inside here is an excellent activity for making (and eating!) Fairtrade banana lollies. The Banana split game is designed for KS2 and features role-play cards and individual tasks. It aims to introduce the banana chain and the reality of where the money from production goes. It is a downloadable pdf document. 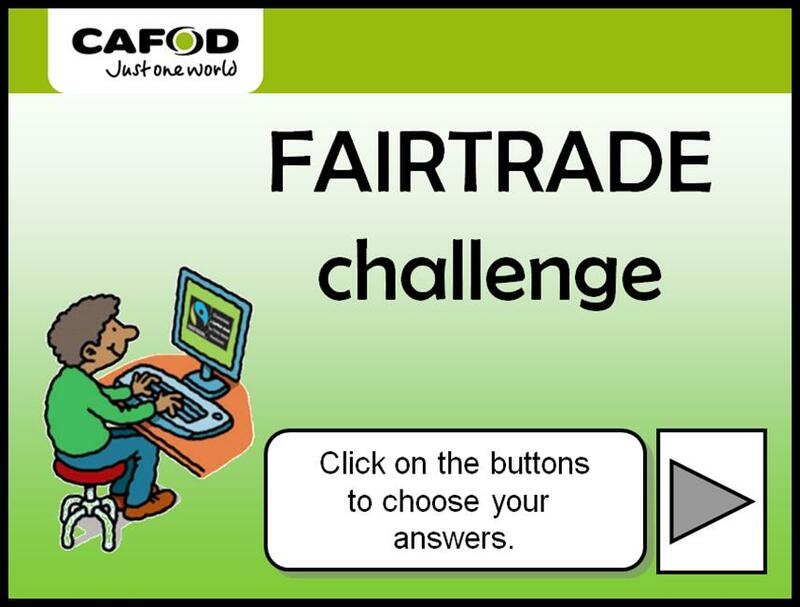 Within CAFOD's secondary Fairtrade resources is a ‘Trading trainers game pack’. 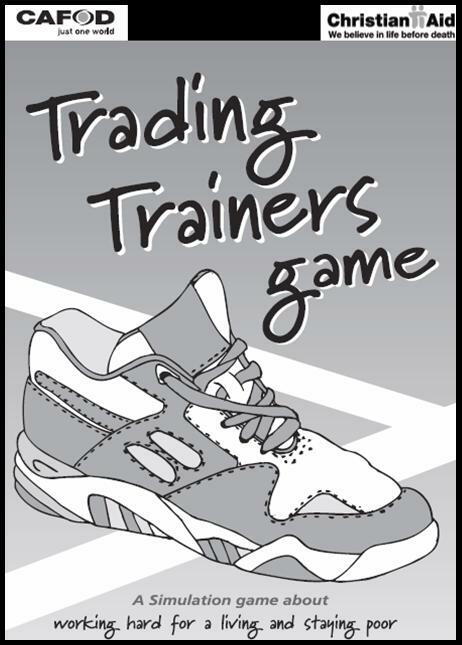 This is a simulation game set in an imaginary Latin American shanty town, where small family businesses are making training shoes to sell to the local market. This 14 page resource pack contains everything you need to play the game. It takes around one and a half hours to play and is very good for larger groups. CAFOD has a number of practical Workshops which feature auctions, treasure hunts, eco fashion shows, lobbing MPs and educational resources. Many other charities have campaigns in progress, and you can find out about these by visiting their websites. Go to our links page to get started.